Passengers flying with Korean Air could be in for a bumpy ride after the carrier’s two pilot unions announced that industrial action was being considered, following a disagreement over wage increase. According to The Korea Herald, Korean Air’s management has proposed a 1.9 per cent pay rise, but the Korean Pilot Union (KPU) and New Korean Air Pilot Union are calling for an astonishing 37 per cent pay hike – the maximum legal wage increase allowed among Korean conglomerates. “Our demand is legitimate as the company froze or inched up the pay increase rate over the past few years,” justified Seo Sang-won from the KPU. 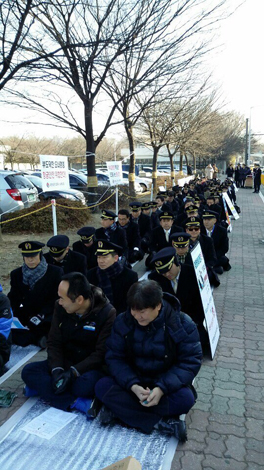 Given the big gap in proposed pay increase between the parties, industry experts are not optimistic that a resolution can be made in time, and Korean Air is expected to face its first pilot strike in a decade. The record-high pay rise calls can be attributed to the growing demand for experienced pilots overseas, particularly by Chinese airlines. According to Seo, some 140 Korean Air pilots left the company last year, with 40 of those joining mainland carriers where they were offered up to three times the pay. “Pilots will continue to be lured by other overseas carriers at a faster pace for the next few years if the company ignores the pay raise demand,’’ said Seo. Korean Air has expressed its disapproval over the 37 per cent pay increase, given the overall competitive market landscape brought forth by Chinese, Middle Eastern and low-cost carriers. Despite the low cost of jet fuel, the airline is still expected to post a loss in 2015.